Fife AC has been blessed with many good officials – covering a wide area with many club organised open races covering most of the county for most of the year it would have to be the case. Pe0ple such as Dave Francis, Eleanor Gunstone, Donald Macgregor and Ian Docherty are all life members. Graham Bennison was suggested as a representative of all the club members who put in such hard work all year round. Graham Bennison of Fife AC is known as a seriously hard working club official – he is pretty well an ever-present throughout the year at cross-country, road and track & field meetings. What is less well known in that he was a very good runner in his own right with best times ranging from 1:59 for 800 to 2:29 for the marathon, and races up to the Two Bridges and London to Brighton. 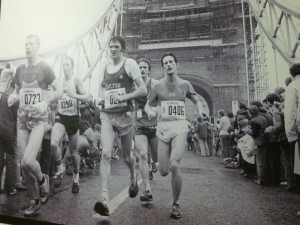 The photograph above was taken during the Three Towers Fell Race, which was a 20 mile race organised by Bury AC and was raced between the mid-60’s and 1990 when it was discontinued. Graham was kind enough to complete the questionnaire below and we can start there. How did you get into the sport initially? I’d done a bit of running at various sports as a teenager but it was at Trent Park Teacher Training College in 1965 that I was asked to run a colleges cross-country championship. A few of us did quite well and formed a cross-country team. Back home that summer a work colleague of my mum’s asked would I be interested in joining Bolton United Harriers. Initially I was running 440 yards and 880 yards but the following winter’s (1966/67) cross-country saw further progress as a distance runner, setting a college course record that lasted until John Bicourt broke it in 1969. I represented Bolton UH for 21 years covering everything from 100m to 100km and was lucky enough to compete in a golden period with the likes of Mike Freary and Steve Kenyon as training partners as well as club colleague Ron Hill. I worked as a teacher in the south of England from 1968 – 1972 and represented Barnet & Dist over track, road and country. I was always’s being called upon to make up the 4 x 400m team. In 1973 (25th August) two Bolton colleagues invited me to join them at the 36 mile 158 yds Two Bridges Race. I placed ninth amongst a strong field in 3 hours 53 minutes 09 seconds, my ultra debut. It was quite a week…. the previous Saturday as a warm up I’d run the slightly uphill Preston to Morecombe Milk Marathon in 2:38.21. On the 21st (my birthday) there was a special 3,000m at Leverhulme Park, Bolton to highlight a Bolton member Peter Lever who had emigrated to Canada and represented them at the marathon. In the local press myself and another runner Gordon Entwistle were not in the reckoning but at the bell it was Gordon who sprinted home (8.53) with me in chase (8.55) leaving a star field behind. I’d had a few wins over road and country before but never was second so pleasing ! 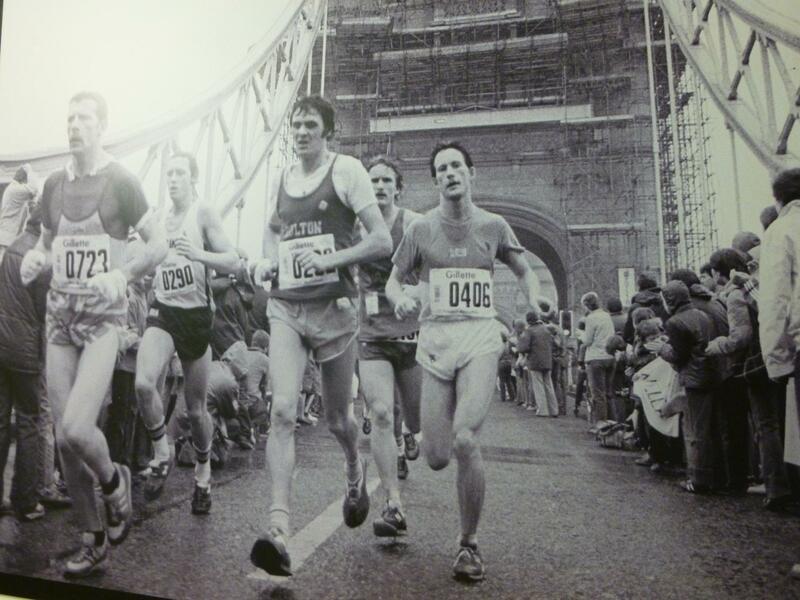 In 1974 I debuted at the Isle of Man 40 Miler and in 1977 achieved 4 hours 13 minutes 24 seconds. More followed……London to Brighton, Woodford Green to Southend and in the early 80’s the Bolton 40 Mile where long time friend Dave Francis placed 1st and I was 2nd. Moving to Fife in 1987 re-kindled my love for the country although in August that year as a veteran over 40 my tendons seriously broke down at the ten mile point in the Two Bridges (I finished…silly sod!) but could never again compete over long distances on the road. Personal Bests? We didn’t have computerised results back then so some like 200m can’t be precise. 100m 12.9. 200m 24 something. 400m 52.5. 800m 1:59.2. 1500m. 4:10. Mile 4:19. 3,000m 8:55 . 5,000m 15.20 Track 50km. 3: 19 ? Road 10km. 32.08. 10 Mile. 50.36 Half Marathon 68. ? 15 mile – 80 minutes ? seconds (Sale 15). Marathon 2:29.40 (Boston April 1975). Two Bridges 3:51.6 (25/08/79). TT 40 – 4:13.24 (1977), Woodford to Southend 40 – 4:23.44 (1976). London to Brighton (52.5 miles) 6:14.05. Thank God I’ve still got some of the certificates otherwise I wouldn’t be sure of some ! Has any individual or group had a marked effect on either your attitude to the sport or your performances? Mike Freary, former UK 10,000m record holder was an inspiration. 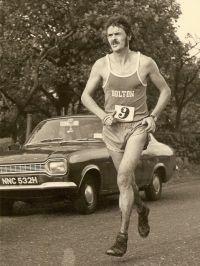 So often Ron Hill would break the course record running second leg for Bolton in many road relays. Mike would run third leg and break the time Ronnie had just set ! What exactly did you get out of the sport? Friendship, confidence, travel, health. Can you describe your general attitude to the sport? Always optimistic, the challenges are out there even as an over 65 veteran. What do you consider your best ever performance? Winning a big field half marathon at Swinton (1979) in 72 minutes something. I felt so, so easy and was way ahead at the halfway turning point, coasted over last few miles ! Running at Boston in 1975 with Ronnie was a big thrill and an experience. What goals did you have that remain unachieved? Just to try to keep running. What has running brought you that you would have wanted not to miss? The camaraderie. Can you give some details of your training? Too spasmodic now but I still would recommend to younger athletes twice weekly speed sessions and the long Sunday Run. Back in the 70’s early 80’s I used to notch up 100 miles a week in the summer months. Do you have any qualifications as a coach or as an official? No ! Do you see yourself mainly as an administrator, coach, official or team manager? (Or even all of the above!). All. Are you involved in athletics outside the club? ie at school or local authority member. Yes many years at school level and am still involved. Are you a member of any group as club representative? Ie at County, District or National level? No. It is very clear from the above that although Graham is maybe seen as an official, administrator or Press reporter, he is really a runner. Any distance runner from the 60’s right through to the present can identify with all, or at least most of the above. The man whose tendons packed in at ten miles but went on to finish a 30+ miles race! The club man who would run in whatever his club needed him to, regardless of distance. A runner from the 70’s who did 100 miles a week with 20 (or 20+) miles on the Sunday and who sought the hard races. When he started out the only graft that most runners received seemed to be safety pins and blisters. 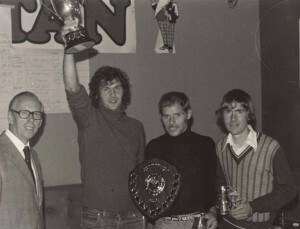 Graham (holding the Trophy) with the Bolton team after the 1979 Two Bridges. It can be seen from the questionnaire that Graham is now in the M65 age group – and he is still running and his ambition is to be able to go doing just that. If we look at his recent racing as noted in the Power of 10 website, then we see that at the time of writing he has run in 22 races at distances ranging from 800m to 8 miles between April and August. 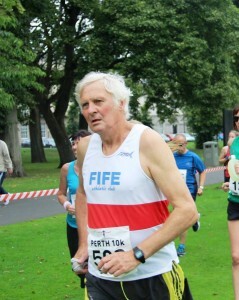 The 800m was in a League Match for his club at Aberdeen and the 8miles was at Ceres. His times at standard distances are One Mile 7:17, 5K 25:11, 5 Miles 43:59. There have been 4 League Matches, 7 Parkruns and 5 Mile races. He has been first in his class 4 times, and second three times. Referred to in the Fife AC website as “the multi talented Graham Bennison“ he has filled many roles within the club since his arrival there. Like any good clubman, Graham served on the club committee roughly from 1990 to 2003, the honour and duty of being club President over the two years 1991-2 and 1992-3 and his subsequent election as Life Member of Fife AC where he is in some very good company indeed including well known athletes, officials and administrators such as Don Macgregor, Allan Faulds, Andrew Lemoncello, Terry Mitchell and Eleanor Gunstone. As a former school teacher, Graham has been involved in Schools athletics for decades and was an ever-present at local, District and National Schools Championships. I well remember seeing him immediately after the end of a long drawn out Scottish Schools Indoor Championships at the Kelvin Hall in Glasgow – these events always over ran considerably – note book in hand, leaning against the wall dictating all the results to local newspapers in Fife so that they would have them as soon as possible – and then setting off on the long journey back. He has in fact coached two Primary School sessions a week for eight years, with one of the schools involved winning the Fife Primary Schools P6 and P7 cross-country championships. Some time ago he was Fife AC Boys and Youths Team Manager – mind you that was when Andrew Lemoncello was in the Under 13 age group. Fife AC is known for its varied programme of open races with interesting names – the Strathmiglo Straddle, the Gauldry Gallop (now sadly defunct), the Strawberry Novice and so on. Graham has been race organiser of many of these races and assisted at many more. He was on the club road race committee for many years and organised many, many races for the club. A fellow club member said “Graham came up to Fife from Lancashire in the mid 1980’s and immediately got involved with the club. He became a committee member and was always a good publicist writing weekly columns for all the local papers and as you know over time became athletics correspondent for the Courier with a particular emphasis on the club. He was also one of the prime guys to encourage the club to organise the many races it does. In particular he was probably responsible for the Hill of Tarvit race and the Ceres 8. He also helped inspire our Summer series held over five races and the Tour of Fife which is five races over five days.” Others have commented on his knowledge of athletes. Another commented on his knowledge of runners – “Graham certainly was pretty good as a results man knowing most of the runners by sight and with a very good memory for placings etc immediately after races. ” He could be seen after races with his notebook and pencil writing down places, names and times as the runners crossed the finishing line, often having a complete list of results before the computer had done its work. Speaking of newspapers, it seems a good place to mention his penchant for communication. Graham has his own Twitter and Facebook accounts, but as far as athletics is concerned, he is listed at linkedin as an ‘independent newspapers professional’, in which capacity he reports on all athletics connected items, particularly to do with Fife AC of course, to the many papers in the Kingdom. Graham has also been team manager for the Fife AC Track & Field team and he has been noted to run in events where the club was short of a runner. 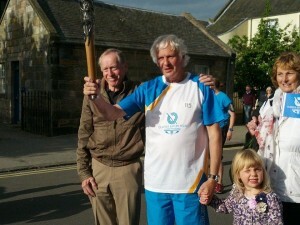 While not a qualified coach, he has assisted Dave Francis with the younger runners. St Andrews athlete Graham Bennison has launched a special Cone to celebrate the arrival of the Queen’s Baton at local institution Jannettas Gelateria, just hours before his stint as Baton bearer. Father and grandfather Mr Bennison (67), who is well-known for his coaching in local primary schools and his athletic prowess, unveiled the triple red, white and blue ice-cream cone to celebrate the arrival of the Baton in St Andrews. The colourful creation, which was made within the Jannettas Gelateria premises alongside the shop’s vast array of other flavours, combines blackberry sorbet (red), vanilla (white) and blueberry (blue) and will be available until Sunday 29 June 2014 at the special price of £3 for three scoops. Once a runner, always a runner but what do runners do when their peak has passed? Well Graham has continued to run but now serves his club and his sport as race organiser, press reporter, team manager, coach and all round clubman.